Winter is here! While many Coloradans are taking to the slopes to enjoy skiing, snowboarding, and tubing, the cold weather can be a challenge for families dealing with asthma. Asthma is a serious, sometimes life-threatening condition, and the incidence of childhood asthma is on the rise. Here in Fort Collins and the surrounding areas, winter weather is unavoidable, and it can often trigger asthma symptoms or make them worse. Pediatric Associates of Northern Colorado is here to help. 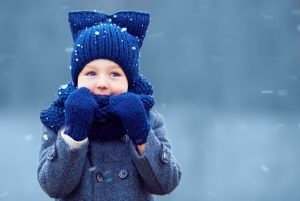 Read on to learn why this season is so hard on those with asthma, and look for more resources here on our blog to help you minimize the challenges that come with cold weather. If you suspect that your child has asthma, or you want to work with a pediatrician on an asthma action plan, contact Pediatric Associates today to schedule an appointment! First, it’s important that we discuss how asthma works. For those with asthma, whether they are kids or adults, they often have trouble breathing because their airways are restricted in some way. There are a number of year-round triggers that can cause an asthma attack, whether it’s an irritant that triggers the muscles around the person’s airways to tighten or exposure to something that further inflames – and tightens – those passages. Narrower airways make it harder to breathe, which can lead to an asthma attack. 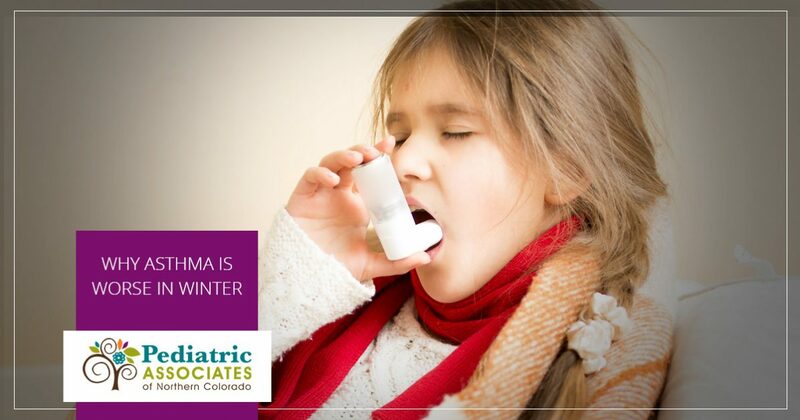 Winter weather creates conditions that expose those with asthma to a number of triggers. In today’s blog, we’ll explain three of the most prevalent. When the weather outside is frightful, we spend much more of our time indoors, and that can expose those with asthma to many possible triggers. Sealing up the house as many of us do to conserve heat and energy can trap a lot of irritants such as mold spores, pet dander, and dust mites inside, and exposure to these can trigger an asthma attack. There are several steps you can take to determine which irritants are most triggering to your child’s asthma, such as undergoing testing at a pediatric office, and then you can make informed decisions about how to limit their exposure. Certain illnesses can also contribute to more frequent asthma attacks, such as sinus or upper respiratory infections. Winter is cold and flu season, and if your child catches the bug, they may be struggling with worsening asthma symptoms as well as the typical fever, fatigue, and sore throat. Some studies have shown that those with asthma are more likely to contract the flu than those without, so make sure your whole family gets a flu shot and learns important steps to staying healthy, like frequent hand washing. During these winter months, sometimes the weather itself is working against you. Simply breathing the cold, dry air can trigger an asthma attack. For one, the lack of humidity can dry out your child’s airways, which are typically coated with a thin layer of fluid. Breathing dry air can cause that fluid to evaporate faster than it can be replenished, and dry, irritated airways can swell and worsen your child’s asthma symptoms. The low temperatures also can be a challenge for those with asthma. Cold weather often causes the body to produce thicker, stickier mucus in an attempt to filter out unhealthy particles in the air. This defense mechanism has advantages and disadvantages, as the thicker substance can narrow airways and make it harder for your child to breathe. The cold can also trigger the production of histamine, a chemical associated with allergic reactions, that can lead to wheezing, or the temperature shock can cause the muscles around the airways to seize or spasm. Winter can be a difficult season for those struggling with asthma, but you don’t have to problem solve on your own. Here at Pediatric Associates in Fort Collins, we work with many families dealing with childhood asthma to brainstorm solutions and preventative measures. Call today to schedule an appointment with one of our friendly pediatric professionals, and keep an eye on our blog for tips on how to make asthma more manageable this season!